Beltsville, MD, September 15, 2010 - energy costs are spurring consumers, both commercial and residential, to seek better, more efficient ways of managing and controlling energy usage. 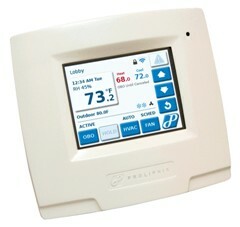 Proliphix, an innovative manufacturer of inexpensive Internet-managed energy monitoring and control solutions, is satisfying this growing demand for greener energy consumption with updates to its Uniphy Energy Control Solution (ECS), including the new UniVista Energy Manager application and new Uniphy IMT550c/w thermostats. Proliphix is successfully using the Empress Embedded Database in its Uniphy family of network thermostats and remote management solutions to keep track of energy data. Energy monitor and control systems are increasing in sophistication as forward thinking manufacturers like Proliphix integrate smart technology into their systems. Looking for an ultra reliable, small footprint, fast embedded database management system that they could cost-effectively embed into their system, Proliphix chose the Empress Embedded Database. The Uniphy family of network thermostats and remote management solutions deliver the features and benefits of a sophisticated energy management system for not much more than the price of a conventional programmable thermostat solution. The Proliphix Un Internet-Managed Energy Control Solution is a sophisticated yet inexpensive energy management solution designed for the small facility owner or operator. The Unip ECS provides remote HVAC system monitoring and control for one or all facilities in an enterprise. Uniphy ECS is ideally suited for light commercial facilities that require comprehensive energy control at a fraction of the cost of conventional energy management systems. Small business owners and operators are able to experience aggressive returns on investment most often in less than a year. Proliphix’s Unip products connect natively to the enterprise data infrastructure and communicate to the Proliphix-hosted software application. Large enterprises with multiple small facilities, can efficiently manage their systems, process equipment and refrigeration units from a single, unified interface from anywhere in the world. Uniphy uses Empress Embedded Database to monitor and store temperature data. Empress Software develops and supports the EMPRESS Embedded Database management system worldwide. EMPRESS is a full-featured, high-performance database designed for embedded developers working with Linux, Windows, UNIX and real-time operating systems. EMPRESS has been utilized successfully in diverse embedded fields including data acquisition & instrumentation, networking & telecom, control & automation, automotive, security, and military & defense For more information, check our web site at or send e-mail to info@empress.com or call Empress at 301-220-1919. Proliphix is the leading provider of Internet-managed energy control systems. In 2004 Proliphix introduced the industry’s first IP-enabled intelligent network thermostat. Today, Proliphix energy control solutions help thousands of restaurant owners, retailers, franchises, schools and government agencies improve HVAC control and reduce heating and cooling costs. For more information, visit www.proliphix.com.